make it handle like it’s on rails, with supreme comfort that fills you with confidence and smiles for miles! Recognized as one of the leaders in suspension upgrades for the Honda Gold Wing is US-based Traxxion Dynamics. For the rear of the big wing, Traxxion offers a replacement shock that we install, properly sprung, for the particular rider and passenger on an individual basis. During the installation we retrofit a braided steel hydraulic hose line and service and bleed Honda’s automated preload mechanism to ensure complete functionality. For the forks, we install new seals, wipers and bushings (mandatory every 40,000 km or less) and custom install fork springs to balance the bike matching the improvement in the rear. On older wings we block off the skeptical anti-dive mechanism as it is no longer required with our fork spring and internal valving work. If you want an even more significant improvement, we can install Traxxion’s fork cartridges, which replace the damper rod in one side and the weak cartridge in the other side with a pair of matched damping adjustable cartridges and custom selected springs for a massive improvement in damping and control. The poor Honda Gold Wing seems to be dramatically under-sprung from the factory. The fork and shock springs installed on these brilliant behemoths are common to bikes 400 pounds lighter. We wish that suspension supplier Showa recognized this and sprung the ‘wings’ appropriately for you but we are here to help. We can start off by doing a sag upon your arrival with your bike, but if you weigh any more than 8-10 pounds, then the bike is under-sprung. So, if you are past your 6-month birthday, come and see us and we can help cure your wallowing, pogoing wing, giving you an improvement in control, safety and enjoyment. Face it, your ‘wing’ is a heavy monster. The relaxed rake and trail Honda selected to give the bike its stability beats up on the fork oil and for sure shortens the bushing life inside the forks. We do some of our high-mileage customers Gold Wings every year! Really the OEM suspension should be serviced every 30-40,000 kilometers. Contact us for your appointment to return your wing to like new condition! Steering head bearings are a great idea to install at this time as well! When you are looking for a massive improvement in your Honda Gold Wing’s suspension we turn to US-based Traxxion Dynamics. For the rear of the big wing, Traxxion offers a replacement shock that we install, properly sprung, for the particular rider and passenger on an individual basis. During the installation we retrofit a braided steel hydraulic hose line and service and bleed Honda’s automated preload mechanism to ensure complete functionality. For the forks, we install new seals, wipers, and bushings (mandatory every 40,000 km or less) and custom install fork springs to balance the bike matching the improvement in the rear. On older Honda Gold Wings we block off the skeptical anti-dive mechanism as it is no longer required with our fork spring and internal valving work. If you want an even more significant improvement, we can install Traxxion’s fork cartridges, which replace the damper rod in one side and the weak cartridge in the other side with a pair of matched damping adjustable cartridges and custom selected springs for a massive improvement in damping and control. 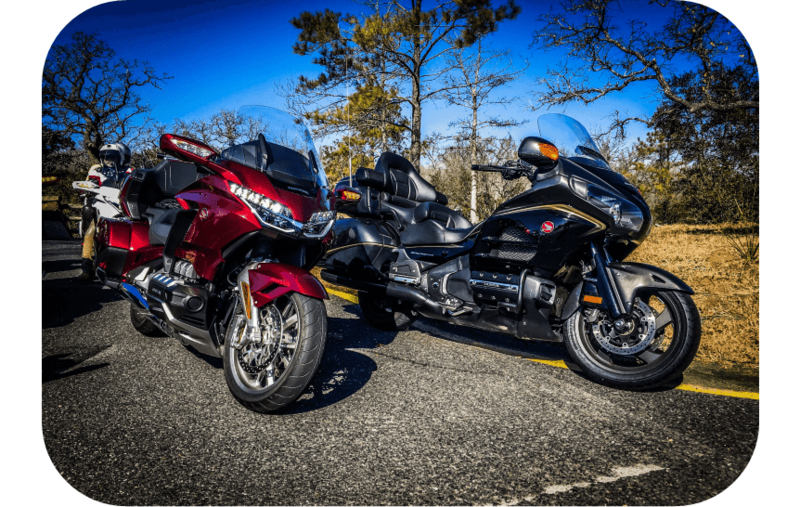 Get the setup you and your Gold Wing deserve.